Orange Printshop, Chapel Hill, NC. From the small southern town of Chapel Hill, North Carolina arose the “audaciously edited” and left-drifting Contempo: A Review of Books and Personalities (Vickers 18). Communist Milton “Ab” Abernethy served as editor, but managed to keep the magazine’s socialist tendencies contained mostly to the advertisements, letters, and articles. The magazine itself focused on art, not on politics. One of Contempo‘s unique features was the “Authoreview,” where authors could review their own work or react to criticism. Authors interacted, conversed, and critiqued each other. Special issues allowed authors to work personally with Abernethy as guest editors; William Faulkner, James Joyce, and Bill Brown each seized the opportunity. 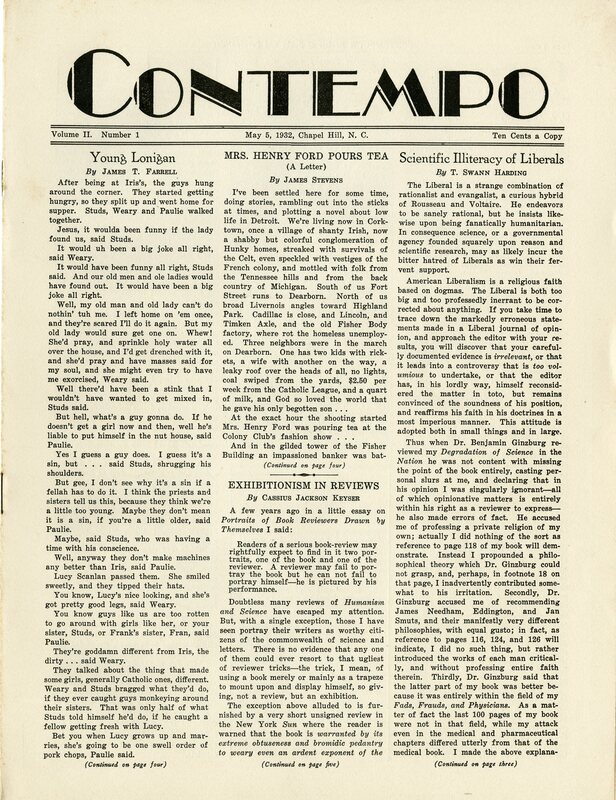 From the magazine’s beginning in 1931, Abernethy and Anthony J. Buttitta were listed as co-editors of Contempo. A quarrel in 1932, however, drove Buttitta to Durham, NC, where he began publishing a competing magazine under the same title. The matter was taken to court, and in March 1933 Abernethy was able to reassure readers that Contempo would continue to be published from Chapel Hill with his wife, Minna Krupsky Abernethy, joining him on the masthead. (4) The rapid reception of new ideas”Our Policy.” 2:1 (5 May 1932): 2. As a sophomore at North Carolina State University Milton Abernethy published several controversial articles decrying administrative decisions and was expelled. He transferred to the University of North Carolina at Chapel Hill in January 1931, where he would meet Anthony Buttitta. The two students established the Intimate Bookshop as a meeting place for their new magazine, Contempo. Financial hardship led the “nonthreatening and generous Communist” to take a job with the US Department of Agriculture in 1932, where he met Minna Krupsky, a Russian emigrant (Vickers 28). Krupsky and Abernethy married, and after a fallout and legal scuffle between Abernethy and Buttitta, she took over as co-editor of the magazine. After the magazine dissolved, the couple “turned their Chapel Hill bookstore […] into a moneymaker” (Hutchisson 97). Later, they moved to New York where Abernethy became a successful stockbroker. Originally from Monroe, Louisiana, Anthony Buttitta was an English graduate student at Chapel Hill when he met Milton Abernethy, and the two established the Intimate Bookshop and Contempo magazine. Buttitta befriended William Faulkner during the famed author’s inebriated visit to Chapel Hill, and the numerous poems Buttita collected from him eventually become part of the Faulkner issue of Contempo (Buttitta). Within a year of the magazine’s run, tensions began to rise between Abernethy and Buttitta, and in 1932 Buttitta moved to Durham where he opened his own Intimate Bookshop and began publishing his own version of Contempo. A subsequent legal battle awarded Abernethy the rights to magazine. Buttitta moved to Asheville, where he befriended author F. Scott Fitzgerald. Buttitta, Tony. After the Good Gay Times. New York: Viking, 1974. Contempo. North Carolina: Orange Printing, 1931-34. Hutchisson, James M. “Nathanael West, Miss Lonelyhearts, and Contempo Magazine.” Resources for American Literary Studies 24.1 (1998): 84-100.